Rex Ryan gets a crack at the Broncos' option looks with Tim Tebow under center, as the Jets find themselves in a must-win type game if they're going to finally win the AFC East. Can Tebow win this week with just one completion? With Willis McGahee and Knowshon Moreno hurt, Denver is down to Lance Bell rushing the ball. However, with Tebow under center Denver is averaging 220 rushing yards per game. The Broncos' offensive and defensive lines have come a long way. Some defense will adjust to Denver's look, but no one will be worrying about who is on Revis Island this week. The secondary will need to be on it's game. The Jets don't have a single star like Megatron. But they have a number of weapons that can hurt you. Champ most likely will play on Holmes or Burress for most of the game. Hopefully Woodyard is back because he will need to cover Keller with some safety help. I worry a bit about the Secondary because I think the Jets will try to get Burress matched up against Chris Harris. The secondary will need to cover all these guys to help out Von Doom so they can get to Sanchez. Speaking of which the front 7 will need to stop the run. 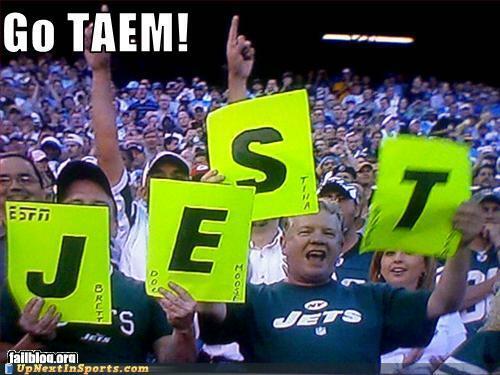 The Jets ain't the greatest run team but it is key to stop the run early. This will force the Jets to put the game on Sanchez's shoulders. This will allow Von Doom to get after him and it is well known Sanchez struggles when pressured. In simple terms, stop the run, pressure the quarterback and this should result in turnovers and sacks. Otherwise three and out and get off the field. Can I just say Larsen! I am loving the Storming Mormon. Was great to see him get more carries. I wouldn't mind seeing Tebow throw some wheels to Larsen. Run some slants across the field and wheel the RB with the slants. Then wheel Larsen to where the slants came from. He should be open for 5 yards maybe even the first because really, who is going to cover the FB. The running game is key for us. It needs to get going and early to setup the game. If the first three series are three and out we could be in for a long game. Ball and Johnson will need to carry the load for the team. Willis may be able to go but I believe the coaches will try to limit his carries. I am also a little worried about Ball's fumble issues. He will need to hold onto the ball. We will need to get the Passing game going at some point. We won't be able to run all over the Jets like we did the Chiefs. We need to throw the ball if we want to win. The probelm is this is made even more difficult because of Revis and Cromartie. I think this will be a big day for the TEs and D-Thomas. I would like them to use Thomas to create some favourable match ups. Have him in the slot with Decker and Royal outside. Attack those backup DBs with Thomas. Decker I would except will have a quite night. I would like to see some more of Green and J-Thomas. Both I think can cause problems for the LBs and Safeties of the Jets. This will also free up the WRs and make it harder to spy Tebow on the run. Just a few things to consider. The Jets don't have that star pass rusher like other teams but all the LBs and DBs blitz to pick up the sacks. Ryan is very creative in sending this guys. The O-Line will need to continue its good form and block this guys as well as open holes for the RBs. Clady no holding penalties! Finally of course a word on Tebow. Other than passing better, better footwork, better accuracy, completing passes and of course winning the game I want to see Tebow pick up the blitz quicker. He has been taking delay of game penalties because he has been slow picking up the blitz and audibling the call. He will need to be faster and not take this penalties, we can't go backwards against the Jets. Plus picking up that blitz will help heaps in the passing game. Just found this and thought it was funny. Decker’s girlfriend, Jessie James, set to sing. You need to google her because she is FIITTT! Nice job Decker. Wills McGahee (hamstring, questionable) sounded confident Wednesday that he will be able to play in Thursday night's game against the Jets. "I feel good," he said. "It’s football, you’re not going to be 100 percent every week, so I’m good. ... It’s going to be good. I’m not going to worry about it, so I don’t think you should worry about it." There will be reports from ESPN and the Denver Post all day Thursday, so we will continue to get a better read on McGahee's status leading up to game time against the Jets. Personally I think it is great Tomlinson isn't playing, he is to the Broncos like Kryptonite is to Superman. He has a field day against us, always. 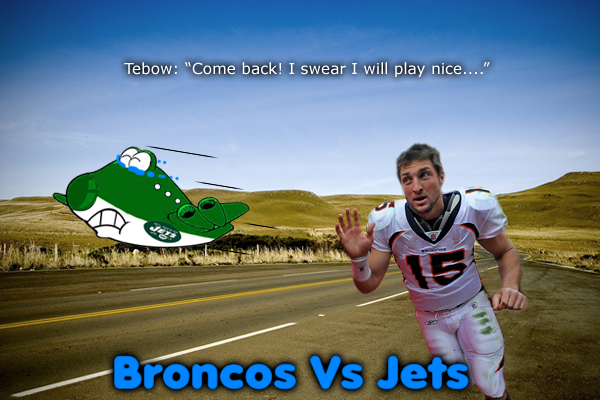 The Broncos have a 16-15-1 record against the Jets (11-7 at Home). The last match up was a year ago in Week 6. The Jets prevailed that day 24-20 on 2 LaDainian Tomlinson touchdown runs. The Broncos should have won that game too, but Renaldo Hill was called for pass interference at the Denver 2 on Jets receiver Santonio Holmes, setting up LaDainian Tomlinson's winning touchdown. Denver has won 6 out of the last 10 meetings and is 4-2 at home during the same stretch. That is it from me, Enjoy the game and GO BRONCOS!~ Aussie. Haha elway will do that to you princess. Nice that is cool you got to talk to Champ, he is my favorite player. That is cool did any of the players comment on your Broncos get up? I have another picture to add to this post but haven't made it yet, was trying to get this out so everyone can see it before the game. Champ was real cool, they all were. Not stuck up guys like some others are. A few players noticed some of my stuff but usually they knew I was a fan once I said something about the game. Was fun talking to them. Who cares about Obama... shoot, give him to the sharks out there just don't give him back to US!! LOL I'm serious... can't stand that fool. That is why I like Champ seems like a real cool down to earth dude. It is unfortunate for Obama, he will be remembered for all the bad things that happened and not the good things he has done. Realisticly if someone else was in his position, if it was McClain, would it be any different? I don't think so. Most things werent his fault, I think he has done a decent job considering the situations he has faced. Great win, really enjoyed it. Goodman had a great pick. I watched this game with some of my friends. When Tebow got inside the 20 I said to my friends the only way the Broncos score here is Tebow runs it in. Next play he does. Way to fight and beat a good team. Added a few updates to the site. I added feeds to John Elway's and the Denver Broncos twitter accounts. They are below the poll. I also added the 2011 AFC West Standings, has the records of all the afc west teams. I thought we may need that with how close this season will be. It is located under the Broncos schedule.